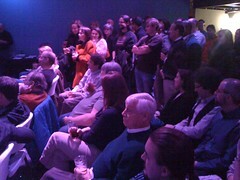 Tuesday night’s forum on the future of local print media went really very well. There were something like 85 people there, but it was tough to get a count, because the space was so overfilled. Dozens of people stood for an hour and a half and didn’t complain once, which was very generous. Our speakers were engaging and interesting, the audience had great questions, and I think everybody had a good time. (The Daily Progress’ Josh Barney was a clear crowd favorite. That guy should go on the lecture circuit.) But the whole affair left most people wanting more—a display of hands at the end showed that about 80% of the audience wanted to do this again soon, which surprised the heck out of me. I’d love to hear from folks about what they’d like a follow-up event to focus on, what should be done differently, what should be done the same, and who they’d like to hear speak. I’m grateful to everybody for coming out, to Left of Center for co-hosting this with cvillenews.com, and to all four of our speakers for their willingness to participate. Sean Tubbs recorded the event for posterity, and you can listen on the Charlottesville Podcasting Network website. Here’s your day-of reminder: the cvillenews.com / Left of Center future of local print media forum is tonight, at Rapture, at 7:00 PM. Based on the RSVPs, it looks like this going to be packed. Given the planned candid talk by editors from three local publications, alcohol, free tasty foods from Rapture, and lots of good company, I can see why. RSVP on Facebook or, hey, just show up. Chicken farmer and faux celebrity Tommy Garrett has subpoenaed me for evidence in his lawsuit against The Hook. In the incredibly overbroad subpoena, his attorney asks for full documentation about any time I have ever communicated with anybody, ever, about Garrett or the lawsuit, along with everything I know about everybody who posted a comment to my blog entry about the case: names, e-mail address, IP addresses, etc. The idea that I could have any information relevant to this case is absurd, since I hadn’t written a word about the matter (or even heard of Garrett) until after his lawsuit had been filed. What Garrett and his attorney may not know is that I’ve got a bit of a history of not taking any guff on the legal front—I was among the plaintiffs who took the youth curfew case up to the Supreme Court in the mid-90s, and I prevailed when Mattel came after me in federal court in 2000. So rest assured that I don’t intend to give up a thing unless compelled to do so by a court. Unfortunately, “hiring a lawyer to quash a subpoena” doesn’t appear in our household budget, so I’m acting as my own attorney here. But, hey, I’ve been exploring getting a law degree, so here’s a chance for a crash course. The requested information appears to be variously irrelevant, unnecessary to the case, confidential, and privileged. I’d chalked up Garrett as a harmless kook, and pitied the guy enough that I’d resolved to basically ignore this matter save to cover the aspect of a local media outlet being sued. But my perspective is now considerably less charitable. You are currently browsing the cvillenews.com weblog archives for the Site News category.